In early December, Taylor Swift launched her own social network - The Swift Life. As planned by the singer, a free application should unite fans of Swift, as well as communicate with their idol. One registered user named Stephanie shared her story on how generous singer bought a house for her. Mom of pregnant Stephanie approached Taylor with a request to encourage her daughter, since her husband lost his job and they had nowhere to live. But Taylor has decided to support not only in word, but in deed and helped to get home for pregnant girl . The American singer Taylor Swift made an incredible gift to pregnant admirer, which at one time did not have property, and her husband lost his job. The performer has learned about the history and gave the family a new home. 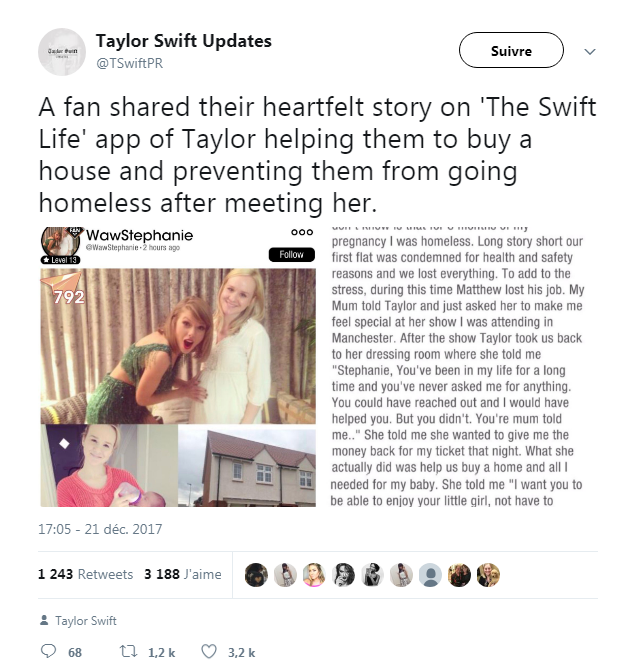 Relevant story appeared on the "Taylor Swift Updates" Twitter-page, published the story of a homeless girl Stephanie. "I finally decided to tell you about what happened to me. Many of you do not know that I was homeless for 8 months, and my boyfriend Matthew lost his job. My mother told about this Taylor and asked her to please me during a show in Manchester. After the concert, Taylor has invited us to her dressing room and said: "Stephanie, you are present in my life for a long time, and you have never asked me about anything. You could do it and I would have helped you, but you did not.. . Your mom told me .. ", - she admitted. She added that Taylor wanted to return her the money for the tickets, but in reality, she helped her to buy a house and all that was necessary to the child. "Taylor told me:" I want you to enjoy motherhood, your little girl, and did not worry about all this . "I will always love her." - summed up a grateful fan. Taylor Swift is known in the music industry as a generous philanthropist who gives tens and hundreds of thousands of dollars on the treatment of sick children, adults, and often funding for various projects. American singer pays off debts for the education of their fans. More about her charity you can read here .